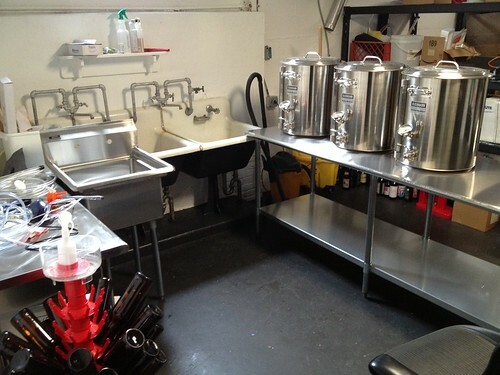 We picked up the stainless steel table and sink yesterday from the restaurant supply store. We got a smaller table from Costco a couple weeks ago that was too good to pass up. Next week the electrician is coming to add a GFI at the fusebox, add a couple electrical outlets and replace the fluorescent light with a nicer fixture. I also moved my old Klipsch speakers down to the brewery so I can be like Surly and blast death metal while I brew. The plumber should be here next week to remove the old sinks, install the new sink and some other minor plumbing work. It’s been 11 weeks since I ordered the control panel for the brewery, so if they meet their 10-12 week promise, it should be on its way by the end of this week. I still have to modify the kettles to install input and output valves and the electrical heating elements. I have all the tools and equipment for that now, so I can do that anytime. The ventilation hood should be built in a week or two so I have some time to figure out how I’m going to mount it and connect the vent to the outside. So I could be brewing my first beer on it by mid-February.